Ask fellow campers about "Destin Army Infantry Center Recreation Area (Military FamCamp" and nearby attractions. This is an older RV park and the sites were fairly tight. Cable and all other utilities worked great. Site had nice concrete with picnic table and grill. Finding space for tow was tough due to lot closeness. We were unable to use satellite because of trees. We were on 2103. Lots of dogs! And rude owners that did not pick up even tho bags and trash can were provided. We stayed 3 weeks to see family in area. Doubt we would use this camp again We camped at Destin Army Infantry Center Recreation Area (Military FamCamp in a Motorhome. This is a beautiful facility located right on the bay and near downtown Dest in. So many nice amenities and a gorgeous pool, pier, harbor. This was our second visit to the campground and would love to go again sometime. Just one negative thing. The sand burs are a pain. Maybe some spray treatment to get rid of them. We camped at Destin Army Infantry Center Recreation Area (Military FamCamp in a Fifth Wheel. Very nice and clean. Staff are very helpful. We camped at Destin Army Infantry Center Recreation Area (Military FamCamp in a Motorhome. Beach and restaurants are great. We were told that this was a very tight layout and that we would likely not be able to extend our awning. But that certainly wasn't the case. If you have a big rig, I'm sure you need to take your time navigating around the small circular campsite. And backing in for a large trailer or 5th wheel might be challenging. But we found rigs of all sizes and shapes, and in no case was anyone that close to one another. In addition to a spacious pad for your home on wheels, there is a separate concrete pad for you towed vehicle, and another for the patio and picnic table. You are less than 100' from the bay, and just 1 mile from the Destin "strip" (restaurants, souvenir shops, and bars). Even though the pools were closed for renovations, we will definitely go back again. Since there is a hotel and villas on site as well, it is an excellent spot for a gathering of military friends and family. Great FREE wifi, and clean baths, slower and laundry. We camped at Destin Army Infantry Center Recreation Area (Military FamCamp in a Motorhome. Great price and good place to stay. Good electric. Close to everything. Nice and quite. Road is narrow but backed in OK. Nice concrete pads with lots of room. Military only beach down the street a few miles. Everyone was friendly. Would stay here again. We camped at Destin Army Infantry Center Recreation Area (Military FamCamp in a Motorhome. This park is about a mile off the main drag thru Destin and is quiet, on the water, clean and most facilities worked fine. Watching the birds and boats on the water is great. WiFi only worked in the office. This park is not on a military base which probably accounts for the very close spacing. We have stayed at numerous military famcamps across the country and this one is not typical. While some sites are large enough to fit in a 40 ft motorhome, some are suitable only for a small travel trailer. Parking for towing or towed vehicles is also tight. We were barely able to get our 3/4 ton longbed off the street. Some had to be parked elsewhere. If you are adept at backing and parking your rig, it is OK. Not for beginners though. We would stay here again just for the waterfront and the great places to eat close by. We camped at Destin Army Infantry Center Recreation Area (Military FamCamp in a Fifth Wheel. Army Rec Center is a small complex of motel like apartments, duplex type cabins and closely packed RV sites. The sites are FHU, cement and in some cases almost level. There is a swimming pool, kids water play area, and a fishing pier. A favorite activity seems to be watching the sunset from the rocky coast along the park edge or fishing. Downtown Destin, with it’s tourist trap restaurants, store fronts and kiosks is about 1 ½ mile drive/walk. If you have a rooftop satellite dish on your RV, be sure and ask for a site clear of trees. There is cable TV in the sites and apartments. A pressure reducer is not needed for RV's. Patrons make reservations a year in advance to be able to come here. Eglin AFB golf course is located off base and is about a 25 minutes drive from this recreation facility. It is also less expensive than the closer civilian courses. Traffic, especially on weekends, is really slow and backed up coming into Destin so don’t be in a hurry. They advertise freeWiFi from hot spots but it is mediocre at best. We camped at Destin Army Infantry Center Recreation Area (Military FamCamp in a Motorhome. This park is in a great location. Is right off Hwy 98, just a few miles from the beach and right on the bay. Lots of stores, restaurants, activities close by. It is a small park and is pretty tight pulling in with a larger RV. Some lots are more accessible than other. Our lot had several trees that we had to "hug" with the back of our trailer in order to fit! All lots are back-in. We camped here in a 37' rig. The park is clean, marina right on the premises, nice laundry facility. Would definitely stay here again but will try to get one of the larger and more "user friendly" lots. We camped at Destin Army Infantry Center Recreation Area (Military FamCamp in a Travel Trailer. Costs per night varies with amount of time you stay. Wi-Fi was great. Looks like they're adding to the Wi-Fi which will make it even better. Nice heated pool, kiddie wet pad, patio by shore. If you want there are rooms and cabins with kitchens available. Military only but if you're active or retired, you can't go wrong stay here. Staff is wonderful taking care of us and the campground, too. We camped at Destin Army Infantry Center Recreation Area (Military FamCamp in a Fifth Wheel. Stayed here for a week in July. Beautiful park with lots of amenities and friendly staff. Restrooms were very clean and although some sites are a bit tight we had no problem with our site. Overall it was a great place to stay. Excellent cable service also. Only 2 issues kept me from rating this a 10. 1. WiFi should be free - almost all commercial campgrounds offer this service at no cost now and as a military benefit I think this is ridiculous to still charge patrons for internet. 2. There should be an ice machine in the RV area. If not a free one like the motel/duplex area has, then one of those vending type ones at least. Campers need ice, and it would have been a better use of funds than the colored lights that were installed to make the pool area look so pretty at night. Just my opinion. We camped at Destin Army Infantry Center Recreation Area (Military FamCamp in a Fifth Wheel. One of the best kept secrets in the military campground system. Great staff: friendly and accommodating. Concrete hardstands and full hookups. Wonderful sunsets every evening right on the bay. Near good shopping and a couple of miles to the white sand beaches. Wonderful place! We stayed here 10 days and will do it again! We camped at Destin Army Infantry Center Recreation Area (Military FamCamp in a Motorhome. OK folks, this is a great park. First it has been here a long time, but the staff have up graded and keep the grounds and bathrooms spotless. We stayed here 10 days with a 34ft rig and toad and had no problems parking. The roads are narrow, but if you can handle your rig, it is not a problem. And when you do pull in other campers are more than happy to help. I had my awnings out and so did my neighbor and we had plenty of room. Also when we were there two coaches over 40ft pulled in and parked with no problem. The sunset views are out of this world over the bay. They have jet ski and boat rental. You are in the heart of Destin but would not know it. It is very quiet and the staff is great. This is a military campground which is nice because it gives you a chance to say thank you to the people who have served. We will be back and hope to stay longer. Great park. 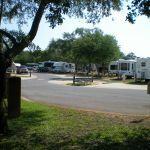 We camped at Destin Army Infantry Center Recreation Area (Military FamCamp in a Motorhome. I don't know what the previous campers were looking for, but this is a very nice military campground. The staff were friendly and helpful, camp and showers were clean and well kept. We would not hesitate to return. We camped at Destin Army Infantry Center Recreation Area (Military FamCamp in a Motorhome. I can't believe the previous write-ups. The RV Parking is no more than a parking lot resembling a RV park. Sites were so small that accommodating a 40ft 5th wheel AND a one ton truck was nearly impossible. Had we stayed we would have been right on top of our neighbors with no room for an awning. Entry into park was very tight and narrow as were the roads inside the park. All concrete and asphalt does not make for great living. We had a month booked here and ended up going elsewhere for the extra room. Had I been in a motorhome with a small toad and not staying very long I would have stayed, but not for an extended time. Attendant at the desk was not very friendly, A smile goes a long way when greeting people for the first time, maybe he didn't know how to smile. We would not come here again. We camped at Destin Army Infantry Center Recreation Area (Military FamCamp in a Fifth Wheel. Are you affiliated with Destin Army Infantry Center Recreation Area (Military FamCamp ?